Another post from Deedy AKA Dorothea Jensen. When I visited Santa Barbara, California last winter, I went to see the exhibits at the Santa Barbara Mission there. It was one of those established by Spain on "El Camino Real" going up the California coast. This is one of those exhibits. Update: Help Honor Lafayette, "America's Favorite Fighting Frenchman!" From Deedy (Dorothea Jensen) who is still commandeering our blog. . .
OK, this is just an update on the post below. $23,250 of the necessary $35,000 has now been received or pledged! 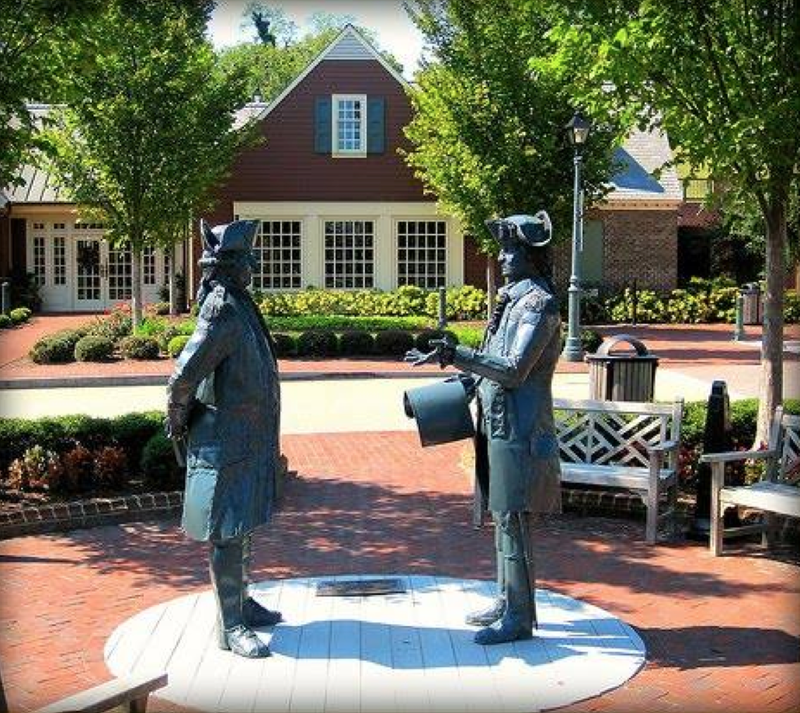 In historic Yorktown, Virginia, site of the final major battle of the Revolution, there is a duet of statues honoring General George Washington, commander of the combined American and French forces, and French Admiral François De Grasse, commander of the French fleet that "bottled up" the British troops under General Cornwallis at Yorktown. These life-sized figures were created by Virginia sculptor Cyd Player. Installed in 2005 and enjoyed by tens of thousands of visitors annually, the statues commemorate two important meetings that took place on board De Grasse’s flagship the Ville de Paris to plan the 1781 Yorktown campaign and to explore plans for further operations. The reason that Lafayette and Rochambeau are not represented here? There was not enough funding to create all four statues at the same time. Now the national organization dedicated to honoring the young Frenchman who did so much to help us gain our independence, the American Friends of Lafayette, is teaming up with the Celebrate Yorktown Committee of the Yorktown Foundation, and other interested organizations and people, in order to commission a statue of Lafayette. The new statue will accurately portray this important historical event and provide an opportunity for visitors of all ages to discover and recognize the role Lafayette played in shaping America’s history. The goal is to get the statue finished in time to be dedicated on in October, 2017, at the annual celebration of the American victory at Yorktown. To date, over $20,000 of the necessary $35,000 has been pledged. Please consider contributing to this exciting endeavor and helping to construct history! The AFL is a 501(c)(3) non-profit organization and contributions are eligible to be tax-deductible. P.S. Finally, you might want to become a member of the American Friends of Lafayette. The cost to join is minimal, and it is great fun to get together every year to learn more about General Lafayette and other figures and events of the American Revolution. There is also a great publication, "The AFL Gazette", with information about Lafayette sent out to all members several times a year. Deedy is "Over the Moon!" Deedy (that's Dorothea Jensen to you) is all excited because her Other Kind of Writing got an excellent editorial review. We happily promised her we would share her post (below) because she told us she is working on an Izzy Elf Thingy unlike any she has done before. Much excitement around here at that prospect. One of us Izzies was even heard to mutter "and about time, too". Anyway, we all hope she'll tell us soon what Izzy Elve Thingy she is working on! Bizzy, Blizzy, Dizzy, Fizzy, Frizzy Quizzy, Tizzy, and Whizzy. One tricky bit about being an author is that you are constantly in the cross hairs of readers/reviewers/critics who can easily broadcast negative reactions to your books far and wide. Ouch! That is why it is especially gratifying when someone, especially someone who knows about books, writes something positive. Hooray! In any event, here is something very gratifying that just came in. It is the Critic's Report for the Booklife Prize in Fiction for which I entered A Buss from Lafayette. Whew! Fifty years after American independence, General Lafayette is visiting all 24 of the new nation's states and everyone is eager to catch a glimpse of the honored guest, even 14-year old Clara Hargaves. Jensen effortlessly weaves history together with the daily trials of a girl resenting her stepmother’s reminders to behave like a lady. 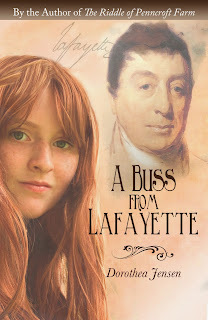 Most schoolchildren know Lafayette’s role in the Revolutionary War only superficially, and Jensen makes him come alive in a way they will remember. Historical accuracy, character development, and engaging dialogue enliven this narrative and make it an enjoyable read.